The OSU Master Food Preserver Program presents a four-part demonstration workshop series on preventing wasted food, in collaboration with the Corvallis Sustainability Coalition’s “No Food Left Behind” project. June 25: Intro to Preserving Fruits. This is where we start. Review basic resources, techniques, and equipment for boiling water canning, the method used to preserve fruits, pie fillings, jams, jellies, and juices. July 9: Pressure Canning & Dehydrating. An overview of the simple, safe method of preserving meats and vegetables with a pressure canner. There’s really nothing to be scared of! Also an introduction to drying foods, a method of preservation gaining popularity. July 23: Preserving Tomatoes & Salsas. Review current, safe methods for tomato preservation including “The Laws of Salsa,” and green tomato options. 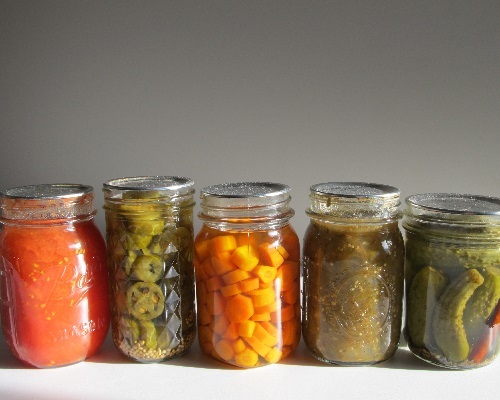 August 27: Pickling Pointers. Pickles are popular again. Learn about selecting ingredients and simple methods for fermented and quick pickles you can prepare to perk up your meals. All sessions run from 6:00 – 7:30 pm in the main meeting room.